Snack Girl knows how you are feeling right now. Too many bowl games? 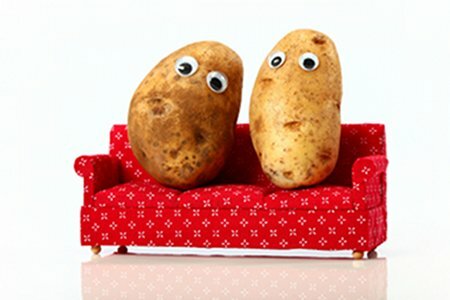 But, don’t call yourself a “couch potato”. Call yourself a “couch potato chip”. Potatoes are not the same as potato chips. For example, humans can actually survive healthily on a diet of potatoes supplemented only with milk or butter, which contain the two vitamins not provided by potatoes (vitamins A and D). I would not suggest you try this with potato chips. and you get 35% of your daily value of Vitamin C and 10% of your daily value of iron. I happen to really like potatoes because they are cheap right now. I bought 10 pounds for $5 and they are perfect for the cold, wintry weather we are having. The problem is we load them. Potatoes are not guns. Why we insist on putting sour cream, butter, and bacon on a potato in mounds is a mystery to me because they taste great with very little seasoning. Okay, they also taste great “loaded”, but that is a terrible way to stay healthy. Scrub your potatoes, dry them, prick them with a fork, wrap them in aluminum foil, put them in a slow cooker on low, and leave them for 7 hours. What will happen? Well, you will walk in after a hard day and smell the wonderful scent of baking potatoes. Grab some fresh salsa and a little bit of cheese and have a lighter potato with added vegetables. Add some black beans mixed with corn and some tabasco? How about salt, pepper, and some greek yogurt? Take a good hard look in your fridge and see what you can find that isn't butter, sour cream, and bacon and put it on your potato. What do you put on your baked potato? I use a little Smart Squeeze (Smart Balance Squeeze Butter) and a Laughing Cow cheese triangle. Very good and low WW points plus. I also sometimes use lowfat cottage cheese. Tastes a lot like sour cream. Enjoy! I hate that potatoes get a bad wrap! I love them!! They are fantastic little vegetable!!!! Interesting website about the potato by a doctor. Worth reading. I add steamed broccoli and lowfat cheddar cheese and dinner is done! YUM! If I eat potatoes, and it's rare, it's a sweet potato. white potatoes have a high GI and are just meh when I try them. so many better options for vitamins, potassium, TASTE and nutrients than a plain jane white potato. I agree with patti's category for white potatoes! I'll leave them out of MY skinny choices for 2013. Can you cook sweet potatoes like this? I love potatoes in pretty much any form but french fries (I know I'm weird). To make them healthier, I top them with low fat greek yogurt and a bean salad made of: black beans, kidney beans, white beans, red wine vinegar, olive oil, tomatoes, and cilantro. Sometimes I add corn but not always. I do love them with butter and sour cream but I try to make that a rare treat. I like sweet potatoes but not everyone in my family does. We've found that mixing 1/2 sweet potato and 1/2 yukon gold and mashing them together makes a mix everyone likes. My RD philosophy: if you like white potatoes eat them! As snack girl posted they have a lot of great benefits when not loaded with fat or when you don't consume the ones the size of your head. Only eaten in large quantities will it effect your triglycerides (not total chol unless loaded with sour cr/butter/bacon). All carbs are sugar when not burned off (used) by the body. Are there better carb choices:sure but do they have to be on the forbidden list- only if you can't control yr consumption. As for GI, it also depends on what you eat the food with, how it's cooked and then when its eaten (potatoes eaten the next day have lower GI). Happy New Year! Hope we can all find peace in what we eat. No one ever got fat from eating a baked potato. It's what they put on them that matters. Scrub the skin good and eat that also. Baked/microwaved, plain potatoes can be pretty darned dry and hard to swallow, and that's why I think we are tempted to put greasy stuff on them. I actually like boiled red potatoes with some salt, because they aren't dry. I will sometimes use salsa on a baked potato, but it has to be great salsa as the potato will only taste like salsa. I like sweet potatoes, microwaved in the peel, and topped with agave nector or real maple syrup and a sprinkle of real cinnamon. This keeps it from being too dry. Sometimes I also top with raw, organic, chopped pecans or walnuts. Sorry to be dumb, but what is GI? Will try this tonight with a 4 bean, lean hamburger chili on top. Yumm. Potatoes are also packed with potassium -- it's in the skin, though, so don't peel them! Unloaded potatoes are great; thanks for the reminder, Lisa. When my wife and I are out and let ourselves get too hungry, it's straight to Wendy's for two (or three!) plain baked potatoes. Some salt and pepper and that tides us over for a little while. I, too, like the Yukons for the above method. Andy D - At a craft fair I bought a home made fabric container that is to be used in the microwave to bake the potatoes. I could of saved myself some money by using a oven mitt. Same idea. It does work well. I like the idea of the crock pot though for when I make my husband sweet potatoes. Usually I bake 5 to 6 in oven on a Sunday and he has them for the week. I am trying this today! You give so many unique and inspiring ways of doing things...thanks SG! @Sue K- I actually bought off ebay a pair of the containers you mentioned and the first one caught fire. It was then that I learned the importance of making the towel completely damp (so that the potato steams, not bakes) and watching it carefully until I get a better feel for size/time calculations! And I'm with you -- it does work well and makes for yummy potatoes. But your crock pot idea has me interested -- do you put the sweet potatoes in water in the crock pot and let them cook during the day or something else? Thanks in advance! Holly...GI is Glycemic Index. It's how fast your body converts carbs to sugars. Google it for the whole story. So, white bread is a processed food, white rice is a processed food - both have the nutrients removed from them. Potatoes have carbohydrates BUT they also have nutrients which makes them a better choice. Sweet potatoes have even more nutrients than white potatoes (that orange color is Vitamin A, baby) - so if you like them - bake them in the slow cooker too. Most of us are trying to stop eating crap and potatoes are definitely not crap. That is my take. I would do them the same way as regular potatoes in the crock pot. Wrap in foil, no water. Thanks for the warning about wrapping in paper towel first. The instruction never mentioned that. It makes sense and I guess I was lucky it didn't catch on fire. It seems that our bodies have an easier time getting the benefit from plant-based proteins (it sounds, to me, like animal protein is too biosimilar to human protein, so our bodies try to eliminate it, not digest it), so she and I are content with the above "low" protein percentages and don't worry that we're not getting the 30-40% (or higher) RDA (which, I'd argue has a strong animal-protein industry influence). And thanks for the details, Sue K. I'll try that soon! Hi there, We love potatoes- white or orange! I can't wait to try the slow cooker method. I add steamed broccoli & just a small bit of grated cheese on top. Thanks for the reminder. Sometimes people get so caught up in the GI levels that they miss the point of eating a variety of vegetables and carbs. Think of the GI levels in process foods, not real food. I like to top a baked potato with fat free cottage cheese and a bit of S&P, no butter necessary. I prefer sweet potatoes and intend on trying your crock pot method. Thanks for the idea, Snack Girl! Red-skin potatoes, cut up in small chunks, tossed with olive oil, salt & pepper, roasted. Perfect. A little olive oil, enough smoked paprika and some coarse salt, ummmm! not to get too off topic...but I have a potato swap I can't help but sharing. For all of you who are fans of homefries...you can do the same thing with tempeh and create a tempeh hash that is terrific. Cook some chopped onions and garlic in olive oil, add tempeh and break it up with a wooden spoon in the pan...add some soy sauce, and a little bit of paprika and cook ~10 min @ med/low heat...top with salsa if desired when done and this makes a very filling breakfast with the protein from tempeh! So just to confirm, the sweet potates can be cooked using the same method with aluminum foil in the crock pot? Same amount of time? and no water needed? I'll have to try this!! Have to say I could live on potatoes. Anyway is good. If I can't figure out what to eat I'll eat a potato. Read The Starch Solution. Happy New Year everyone.! @Lynn - it will work. Trust me. Snack Girl, can you define what you consider a 'medium' sized potato. As in when I'm selecting potatoes at the grocery store, about how many ounces am I looking for? Thank you for defending the white potato! I agree that it is a pure unprocessed food that is safe to include in a healthy diet. @Cathy - a medium potato is between 2 inches and 3 inches in diameter and weighs about 6 ounces. I use on my baked potato fat free sour cream, spray no calorie fake butter, turkey bacon and no cheese. But I measure it all out. Should be ok if you allow yourself the calories and such from the items. Cheers to the potato! I reconnected with the pototo in the last year realizong I was missing out on some good nutrition. I like to boil them and top with a little salt and pepper and maybe a small bit of butter if I have some wiggle room in the days consumption. I put lots of veggies on mine--love broccoli and onions! Also make chipped beef that is yummy and put a bit of that on there and a bit of shredded cheese. I lived in Denmark for two years, and realized that I had never tasted a potato before. The potatoes there were so incredibly full of flavor. They were sold at grocery stores in a box of dirt. It made me wonder what happened to the ones we eat here, how they ended up so flavorless. Even organically grown potatoes don't have the richness of flavor that the Danish potatoes do. Even our home-grown ones aren't as good. I grew up in the woods, and we had potatoes almost every night for dinner that we had grown in our garden. By spring time the remaining spuds were pretty wrinkled, and had started to grow, but to this day I still love eating a boiled potato, mashed with a fork, with butter, salt and pepper. A table spoon of butter never hurt anyone, and it sure does a potato good. I LOVE baked potato with Green Giant broccoli and cheese on top!! Basic meal in one and low WW points plus too!!! YUM!! Lynne, thanks so much for sharing that article on potatoes! "Are Potatoes that Bad?" supported Snack Girl's already reasonable-sounding opinion with medical facts. I especially liked how they linked the Satiety Index (surprisingly different from the GI! ); I can't wait to read more about that. Also, Snack Girl: I totally agree with Zennifer that the voice you write with is relatable and energetic. Thanks for all you do! Which greek yogurt do you recommend? A few years ago I had a severe potassium deficiency combined with dental problems that kept me from being able to chew. Potatoes saved my life! Literally! I cubed and cooked them in water with boullion, then drained most of the water, and mashed them. I usually added a mixture of roasted red bell peppers & garlic that I blended in my Magic Bullet, which was absolutely delicious. Do you cook them on low I assume? I like mine with black beans, shredded cheese and tomatoes or salsa. This is my go-to meal when extremely physically active as it helps with potassium and sodium loss in sweat (I live in Florida and sweat a lot here). Mmmmm...potatoes. My favourite are purple potatoes which seem to be hard to come by, but when I find them I load up!! I was lucky as a child, my parents grew a huge garden and potatoes were a staple that we over wintered (including carrots). A word of warning, eating only organic potatoes (including sweet potatoes and yams) as the non-organic variety are sprayed with a nasty product called Bud Nip which prevents the potatoes from sprouting eyes; sprouted eyes on potatoes do not hurt, just cut them away. This is a very toxic chemical that binds to every cell in the potatoe and can't be scrubbed away. It's weird that you say that one can survive on potatoes with milk and butter only, and then go on to not recommend them. I'll keep repeating myself - pastured/grass-fed whole milk (preferably raw) and butter are HEALTHY! Full of healthy fats! Vitamins A and D (D is SO VERY, VERY important!). Our ancestors craved and survived with lots of milk and butter. They were valuable. If they didn't have them, they traded for them. If you serve a potato with veggies or salsa, you are just going to pee all those beautiful nutrients right out. You need a healthy fat to help you body assimilate the vitamins and nutrients. 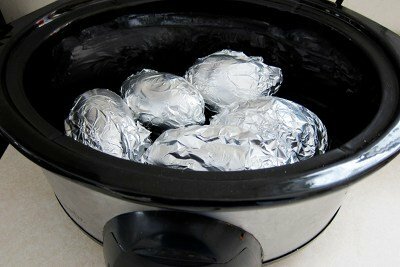 Just for clarification... you put the scrubbed, poked, aluminum foil wrapped potatoes in the crock pot for 7 hrs on low.... without any water on the bottom of the pot? And this doesn't damage the stoneware? Or is it a different type of pot? The idea sounds great, but I don't want to ruin my crock pot. Cristina, I agree. I usually add cheese to mine but butter works too. Plus I make a mashed potato and rutabega combination when only mashed stuff will do to which I add only butter, salt and pepper. I love the chewy skin on oven-baked potatoes; will I get that in a slow cooker if I don't wrap them in foil? I talked to our RD at work and she said the media is bogus! Potatoes are healthy and a potato is not the same or just as bad as chips or fries! Potatoes are healthy esp when lightly seasoned and not gooped fat laden toppings. Glad someone like you is spreading the word! I'm a potato fan! For healthy baked potatoes I like olive oil & roasted garlic, or salsa, avocado & Greek yogurt. Spouse like wasabi & soy sauce on his! Have you tried the Hasselback style? I love those with just olive oil & seasoning, and sometimes a little parmesan is good too! So many ideas.. Can't wait to try the crock pot one!! Never thought of that.. I did/do WW... even though potatoes have points, I did not count them. Of course, I did not "load" my veggie either... Serving size of butter or sour cream, and salt/pepper.. I figure, eating a potatoe was better than eating a larger portion of meat or side of something else.. It works for me. Some great ideas here..
My fave way with potatoes - cut into dice, and steam them. They cook quickly, and sprinkle a few fresh herbs on them - presto! The potatoes are finished. Learned this trick in a low glycemic cookbook. Having a loaded potato every once in a while isn't going to freaking kill you. All white breads are NOT processed. Heck even wheat bread can be processed. If the food is ORGANIC, NON-GMO verified, & USDA verified, then it is NOT processed. That goes for all foods in general. Snack Girl, you should really read the labels more carefully and do more research on food before giving out ignorant advice on something you clearly didn't/don't know anything about. Jenn- you wrote "All white breads are NOT processed. Heck even wheat bread can be processed. If the food is ORGANIC, NON-GMO verified, & USDA verified, then it is NOT processed. That goes for all foods in general." In an attempt to unbundle all processed foods, the International Food Information Council (IFIC) recently developed a scale defining different levels of processing. Researchers then applied data from the National Health and Nutrition Examination Survey (NHANES) to understand which types of processed foods Americans are eating and what nutrients they derive from these foods. That list defines bread (a "Ready To Eat" food) as taking their fourth-highest level of processing, so I respectfully disagree with your claim that "[bread] is NOT processed." In my view, Snack Girl tries very hard to publish information about healthy eating and I think that she will get a lot of agreement that foods, er, "foods" that are more highly processed are less healthy. your ideas are FABULOUS! I don't think if you eat a potato occasionally will kill us! I love baked potatoes and eat them occasionally. Remember variety is the key! My mom once was on a diet and lost like 30lbs. and her doctor told her to eat a baked potato every day. with a little milk and salt and pepper. It worked. Keep up the good work, Lisa my diet would be boring without you to change it around!